Welcome to Facebook Marketing Madness! 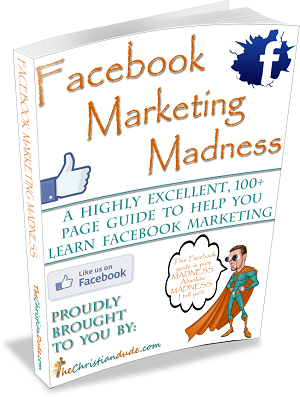 Facebook Marketing Madness is a must-have for Internet marketers. Did you know that there are now over 1 billion users on Facebook? That it is now the most frequented website on the Internet and in the entire world? If you are not utilizing Facebook as part of your marketing repertoire, you are quite simply leaving money on the table, losing sales, and not taking advantage of the huge social media machine that this entity has grown into. The fact is, you don’t have a choice BUT to use Facebook in your marketing any more! Facebook has evolved into a mammoth marketing maven, and countless business owners, marketers, consultants, and more, are utilizing Facebook to build enormous followings, garner tons of sales, and maximize their exposure to insane levels. Newly written in mid-2013, so no old, rehashed, outdated product! Graphics and images throughout, making it “easy as pie” to follow. Additional links, resources, and bonuses. Order and immediate download, even if it’s 4 a/m in the morning! 100 pages long, with over 10,000 words of content. Detailed description and explanations of Facebook pages, how they work, and why they are important to your business, ministry, or marketing efforts. Examples of highly successful, well-made and well-thought out Facebook pages. The single most important step before you actually start building your Facebook page. Questions you must consider for the correct approach of your particular page. Specific and important tips to consider and follow upon registering your page. Pitfalls to avoid when creating your page and its cover images. Important tips to getting the most out of your “about” section, that is even frequently forgotten or missed by big companies! How to effectively utilize Facebook’s powerful (and often unknown) functionality, which has had millions of dollars poured into it. How to post in ways that can help to spread your brand or message virally. The safest route to obtaining as many “Likes” as you desire to your Facebook page. How to use Facebook’s “paid” advertising options. So, we will leave it at that! We are not going to make this an extremely long sales page, nor are we going to make this a “hard sell”. The fact is, if you own a business, have a product to promote, need to find customers, or have a ministry, Christian band, or similarly, you need this guide. Facebook is the #1 website in the world, with over a billion users. How can you sit back and decide, “Meh… that isn’t going to benefit me, my business, or ministry”? Quite simply, you can’t. This guide is the perfect resource to getting started in Facebook marketing, and building a successful or prosperous Facebook page or Facebook business page. This guide will help you to plant the proper seeds, so that your Facebook efforts bear fruit! Buy Facebook Marketing Madness right now for only $17, by simply clicking on the “Buy Now” button, below. Thank you so much, and again and always, GOD BLESS YOU in ALL your endeavors!